1. A cookbook filled with over 70 delicious avocado recipes for new and innovative ways of eating the best food on Earth. 2. 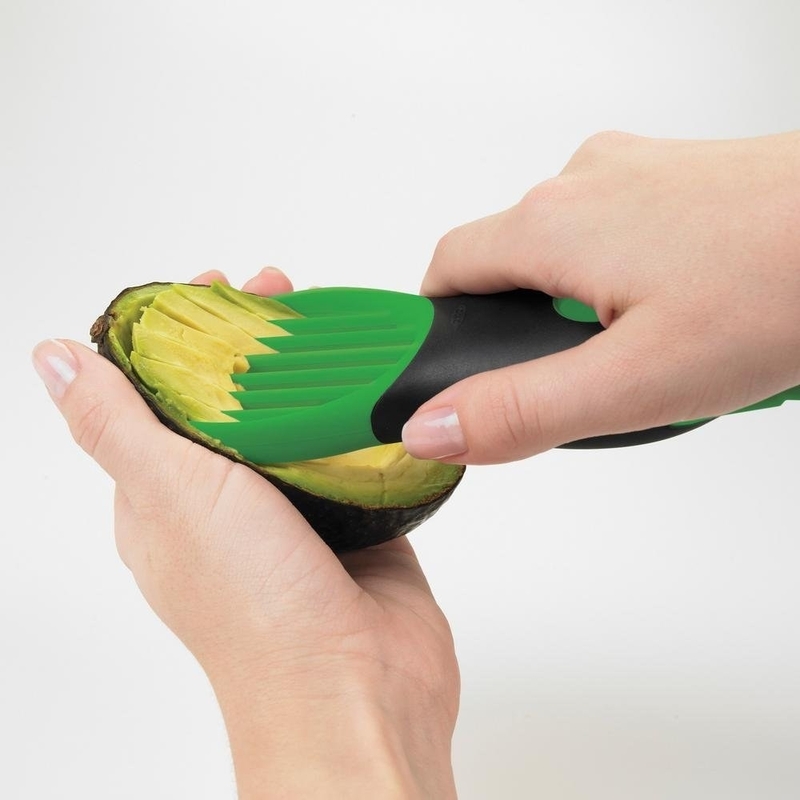 A 3-in-1 avocado slicer to functionally split, pit, and slice nature's butter. It features a soft, non-slip grip, and is top-rack dishwasher-safe. 3. A spoon that'll become your new designated avo spoon, because avo is so special, it really deserves to be used with unique utensils, ok?! Get it from Milk & Honey on Etsy for $18. 4. 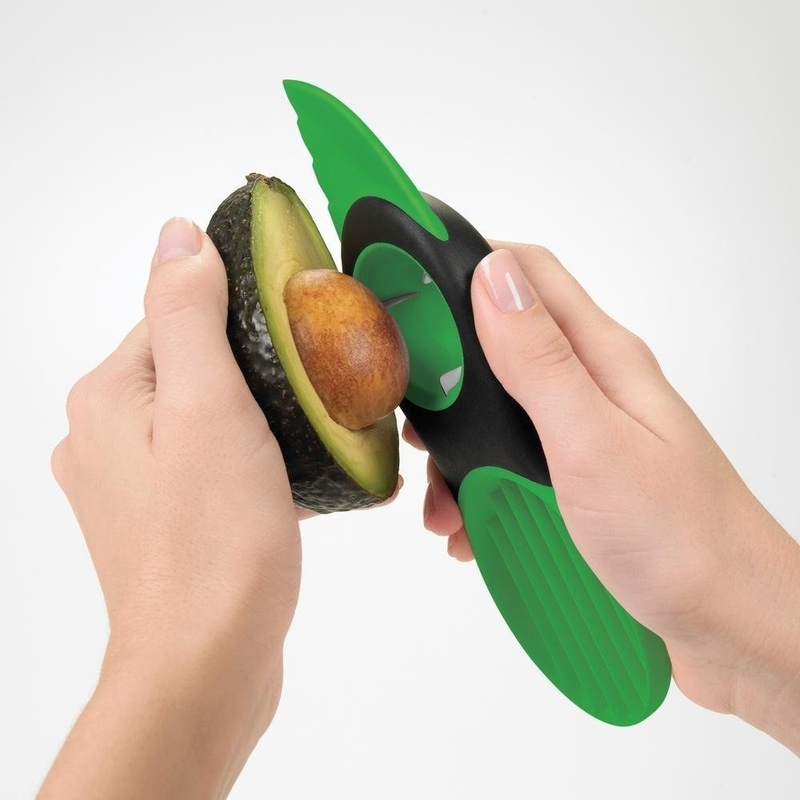 An avocado keeper for lengthening the lifespan of your precious green stuff. There is nothing sadder than opening a ripe avo, storing the other half until the craving strikes again the next day, and finding it all brown and yucky. This is BPA-free, and dishwasher-safe! 5. A guacamole bowl and spoon to serve up the best dip in existence. But also if you use the spoon as a mechanism to just eat guac by the spoonful, I fully support you just as long as I'm invited. Both the bowl and spoon are dishwasher-safe! Get them from Amazon for $9.99 (originally $12.91). 6. A rainbow avocado cutting board that'll make a perf addition in any kitchen — it'll even more amazing when the time comes to cut up AVOCADOS!!! AVOCEPTION BB'S! To clean, hand-wash with warm soapy water! Get it from Urban Outfitters for $35. 7. A container for keeping the good-good, aka THE GUAC, on lock, aka FRESH AF. Made from shatterproof, odor-proof, stain-resistant, and BPA-free plastic. It's top-rack dishwasher-safe! Get it from Amazon for $17.48 (originally $19.99). 8. A pair of avocado friendship necklaces to share with the friend who loves the creamy green stuff as much as you do. BTW, if you have friends that don't love avocado like you do, stop being friends with those people, you don't need that kind of negativity in your life. Just kidding... maybe. Get them from Amazon for $33.50. 9. A crochet throw pillow that'll get you all cozy and cuddled up with your one true love. 10. An AvoSeedo bowl for growing your own avocados using a pit. It takes about three to six weeks to grow, and voila, delish avocado is yours! Get it from Amazon for $10.95 (available in four colors). 11. A pajama set to give to your avo-loving crush, or to just wear yourself to profess your everlasting crush on avocados. Get them from Amazon for $11.99+ (available in sizes XS–2XL). 12. A mug that'll happily be there when you need a sip of coffee, tea, water, or juice to wash down your morning avocado toast. Get it from Urban Outfitters for $8 (originally $10). 13. A salt and pepper shaker for seasoning all of your food items, even if they're items other than avocado. IDK why you'd eat a food that isn't an avocado, like, are there even foods in existence that aren't avocados? Get it from UncommonGoods for $29.99 (originally $45). 14. A power bank to juice up your phone the same way you juice up your tummy — WITH YUMMY AVOCADO! Get it from Forever 21 for $25.90. 15. A pair of avocado socks that'll keep your feetsies warm, cozy, and happy. 16. A PopSocket for attaching on the back of your phone for a sturdy grip, and in a print you will never get tired of. 17. An ornament so you can deck the Christmas tree with the food you feel the same Christmas morning happiness you feel when you're eating avo. 18. A pet avocado that'll serve literally zero purpose other than looking adorable and being your companion, which I guess actually serves a huge purpose. Get it from tinofbeans on Etsy for $6.67. 19. An avocado sheet mask for when you're due for some much-needed pampering. Get it from Asos for $12. 20. A sticker to put on your laptop, planner, notebooks, or just about anywhere — an avocado dabbing in 2018 is what we all need. Get it from Luke Waldrop on RedBubble for $2.88+ (available in sizes S–XL). 21. A pool float for relaxing the day away. Just be sure you have a bowl of tortilla chips in one hand and an even bigger bowl of guacamole in the other one. 22. A greeting card to send to the smart cookie in your life who is also an avo-fanatic, or just to keep to yourself, because when you find a gem like this, you don't just give it away like Oprah gives away cars. Get it from Sleepy Mountain on Etsy for $4.50. 23. An avo notebook that'll be happy keeping your notes, to-do lists, and secrets stowed away inside. Just look at the lil' fella's smile! May we all love avocado as much as Antoni loves avocado.